Should your business really be marketing with daily deal sites like Groupon? Why small businesses are being seduced by daily deal marketing sites in ever more frequent numbers and what the hidden dangers to your business may be. Daily deal marketing sites are big business, no doubt about that but how do they work and who do they benefit? I do get asked about daily deal sites and whether the investment is worth the returns. I actually took a survey of about 25 people and asked them about their experience with sites like Groupon. 74% of them could not recall the actual company they had their deal with. They remembered the daily deal site. Many asked if they would be a repeat customer did say probably, but ONLY IF there was another discounted deal available. Let’s face it, everyone loves a discount and that’s what you are led to believe you get with a daily deal site. Using Groupon as an example as they remain the daddy of daily deal sites. A business is expected to offer a significant discount on its products or services to comply with the deal, usually in the region of 50% and it can be all the way up to 90%. Now that is going to trigger an impulse buy in a lot of visitors. Daily deal marketing sites have a massive database of subscribers they email so you are, as a business, guaranteed to get your special offer some terrific exposure! Assuming the uptake of the offer hits a certain level otherwise the marketing site pulls the deal. Note that the focus here is always on the deal, the actual name of the business providing the deal (that’s your company!) is tucked away in the far recesses of the deal screen. Many customers only see this when they are buying or when they use the deal coupon and its necessary then only to redeem whatever the special offer or discount is. So your product and services get reach and you even get revenue but is this a good marketing tool in its own right? I d say if you are a brand, then it will help for sure. Customers already know your name and if it’s simply a common strategy to get rid of old stock that you probably still won’t make a loss on – as a bonus you also get more names back active on your database. When you look at the real cost of using a daily deal marketing sites for a business, a massive deal price reduction to appeal to the potential mass market first is a hit to the pocket. The when you add in the daily deal costs, typically 50% of the voucher price, there is not a whole lot left over for the business in terms of revenue. Also, you may be turning away regular customers who have always been happy to pay full price or they may then see the discount available to Groupon customers and take that cheaper offer or worse still, feel disgruntled at still paying full price! The promotion and daily deal raison detre is often touted behind these services is that they act as loss leaders, getting customers through the door to take advantage of a bargain and those customers will be spend more at a later date beyond the deal……in theory. A research piece done by the business school at Rice Univeristy showed that this was not the case. It was found that out of all those enjoying the deal only 36% actually went on to buy additional or further services. Even worse is that only 20% returned to make a full price purchases. Whichever way you cut it, that’s an expensive form of lead generation. This study focused on a number of different daily deals sites the same results were evident including more niche deal sites like Top Table who specifically target the restaurant business as an example. If you are a small or medium business (SME) a daily deal offer may be high risk for you, it can work if you use it as part of a bigger overall marketing strategy. Getting customers is one thing but ensuring they remain a customer is a different prospect. You need to take steps to immediately engage and ensure they are added to a re-marketing list so you can stay in contact. Entice them with up-sells and cross sells and make their experience of buying from you so scintillating that it puts the deal to the back of their mind. Wowing a customer is key here! Equally a word of warning, one of the negative impacts of daily deals is particularly prevalent in service industries and that is simply the staff not being prepared for the sheer volumes of customers after the deal. This has been known on many occasions to have a knock on effect on service quality and that in turn has led to an increase in customer dissatisfaction. I absolutely cannot stress this enough as to how very real problem and I’ve encountered it myself first hand. Review sites have been known to be inundated with negative sentiment after a failed promotion all because the staff simply were not prepared and as a result not only has the deal likely been a loss leader but potentially a reputation destroyer! Do not let a deal hurt your brand, it is avoidable but make sure you are fully prepared. Daily Deal Marketing Sites and the Halo effect. Daily deal sites are powerful but they are designed to promote the daily deal site and not the business. It can be argued that they provide a Halo effect and because your business is associated with the brand name of the deal site, then there are secondary gains to be experienced. Yes. you will earn revenue from using a daily deal site but this is not cheap marketing and it’s not likely to be long-term unless you put thought and work into how to keep those customers that the daily deal site send you. It’s a rare customers who knows your business name post the deal so that’s what you need to work on reinforcing then maybe the Halo effect might shine a remote light on you. In terms of your business strategy what are you doing to directly impact your business? Search optimisaton of your website, using things like Google Adwords to run your own dedicated promotions, how about taking advantage of the vast reach of social media? Facebook has been running paid ads for some time now, Twitter has joined the party and they can often be much lower costs than other marketing avenues. Taking a more holistic marketing approach digitally can absolutely help your business. Bizarrely these paid media and other digital marketing approaches typically cost LESS than a daily deal and their results are far longer term. You are not having to offer HUGE reductions and you get the lion share of profits from the sale. Don’t abandon daily deal sites, if it has worked for you in the past, then by all means use them, my advice is to explore digital marketing for your own brand and not share the stage as part of the chorus-line but be the star of your marketing. If you need any help with looking at digital marketing in a broader way and want to get some direct results to positively impact your bottom line then get in touch for a free, no obligation consultation with me now. Is your website making you money? If not then you need this! 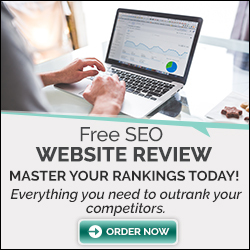 Free of charge that explains what your top competitors are doing and how you can do the same. Guaranteed to increase your revenue. Add your details now to find out EXACTLY what they are doing. No risk and no cost, limited time offer.